Protect your desk or work table from sharp blades, writing instruments and other art and craft tools. Cut paper, film, textiles and more. The cutting mat’s resilient surface heals so completely that cutting leaves no visible trace. Starvin' Artist is an amazing custom picture framer that is also an art supply store in the Chicago area. The mat won’t break down with repeated use and actually prolongs the life of knife blades. You can even use both sides of the cutting mat! 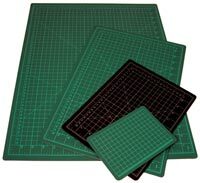 The cutting mats feature 3mm thick PVC, 5-layer construction, a non-slip, non-glare surface, 1/2" grid with 1/8" marks for precise alignment as well as 45° and 60° guides.